Tower of Russia is another huge skyscraper which has been approved nowdays. As known we have Burj Dubai in Dubai with its 705m - 1000m which is under construction. But in Moscow we now have Tower of Russia which will become 648m(2,126 ft) with 134 floors when its completed in 2010. The tower is situated in the middel of the new International Business Center in downtown Moscow. When this is completed there will stand several skyscrapers above 300m finish here. Two is under construction today counting 340m and 305m. But its not sure this tower is to be built. There is also a second version of the tower which was made public this summer. That one is 398m. But the decisson of which one to built is not decidet yeat. The IBC (International Business Center) which is under construction. Overview over the model of IBC. Wow. That is impressive. I hope they build it. I am quite envious! I think that would look great in Atlanta. BTW, if any of those buildings are residential, we would move in there if it isnt too expensive i think, and my dad would prolly move his company there if possible (i dont know if you can do that??)... o and another thing, those old-looking buildings are modern inside, but not outside. I had no idea that Moscow was working for a such a modern skyline. If they build all of this, it will become the most futurestic looking city in Europe. I think they should keep some of the Soviet era architecture however. It is also unique in the world. Remember that London, Paris and Istanbul also have some very large projects going on. These cities will soon have a very modern and spectacular skyline Istanbul's Three Empires Tower it to become 600m if they approve it one more time. 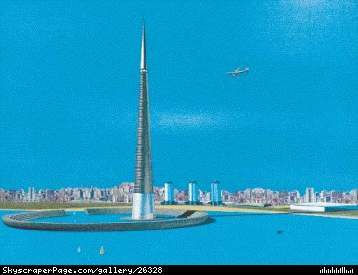 Three Empires Tower in Istanbul is proposed/approved with 600m(150 floors). This is still 10m lower that Freedom Tower.